While traveling along the isolated road in the Big Muddy Badlands in Southern Saskatchewan, the sunset hues highlight the miles of farmland. The soft yellow and orange glow at sunset spans the sky over the acres of farmland in the Big Muddy Badlands in Southern Saskatchewan, Canada. Once a landscape used by outlaws such as the notorious ones like the Sundance Kid and Butch Cassidy, the farmland is now alive with ranches and tourists. Visitors to the Big Muddy Badlands, can travel along the gravel road and explore this unique area where waves of hills rise up from the valley floor. The prettiest time of day to be on the road is at sunset when the farmland is aglow and the sky displays amazing colors. 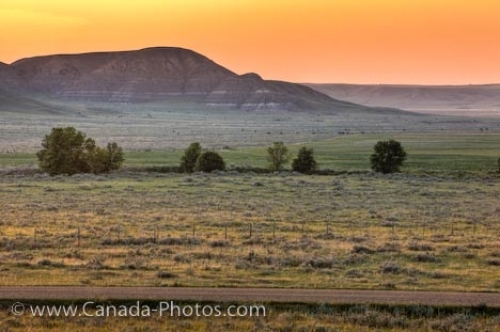 Photo of a road running through the farmland in the Big Muddy Badlands in Saskatchewan as a sunset illuminates the sky.